10 LED's in a sealed oval light base for the stop/turn/run lights on the rear of trailers. Simple replacement of stock units. 3 bullet connectors molded in the back to plug wiring into. Wire and gasket sold seperate. Sold per each light. 10 LED's in a sealed oval light base for the stop/turn/run lights on the rear of trailers. Simple replacement of stock units. 3 wire exit the center back of the light - 8" long & ring terminal on ground wire. Gasket sold seperate. Sold per each light. 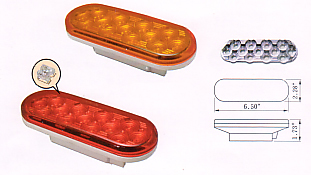 13 LED's in a sealed oval light base for the stop/turn/run lights on the rear of trailers. Simple replacement of stock units. 3 bullet connectors molded in the back to plug wiring into. This is designed for an auxulary light or back-up light. It runs on the brake function on the wiring.